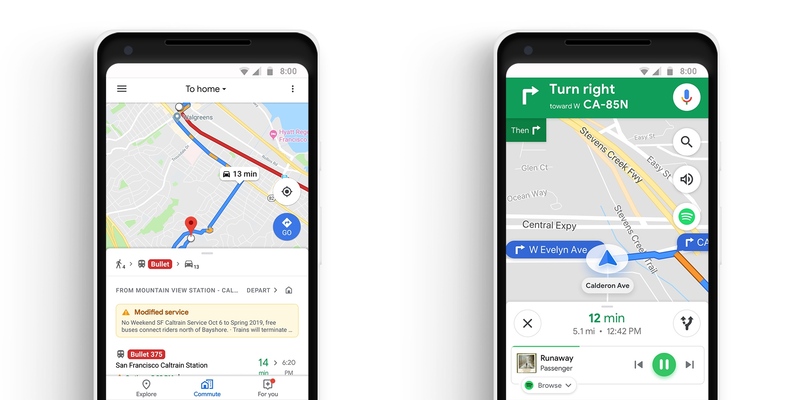 Google just announced new features for Google Maps on Android and iOS. The update is rolling out this week and features a bunch of new features focused on commuting, music and getting more personal data from you. While Google Maps is particularly useful for road trips and vacation, the app also can be useful for stressful commutes. Google is resurfacing some of those features with a new “Commute” tab. After setting up your home and work address, the app will help you know what to expect in the morning and the evening. If you drive to work, Google Maps now tells you how long it’s going to take and if there are any alternative routes. It works pretty much like Waze’s ETA screen and tells you if it’s going to be faster or slower in 30 minutes or an hour. If you take the bus or train to work, Google Maps can help you find out when you should leave. The app takes into account the walk or drive to the station. Those public transit features compete directly with Citymapper and most likely relies on a lot of open data. Talking about public transit, you’ll be able to see your bus or train on the map, slowly moving closer to you. The app also tells you how long you have to wait. This feature will be available in 80 regions around the world. In Sydney, the app tells you how full the next bus is going to be. Unfortunately, this update comes with a privacy drawback. Until very recently, you could associate your home and work address with your Google account in Google Maps. Now, you need to activate “web & app activity,” the infamous all-encompassing privacy destroyer — I used to store my home and work address and I can no longer change those addresses without enabling that. If you activate that setting, Google will collect your search history, your Chrome browsing history, your location, your credit card purchases and more. And Google nudges you to activate that “feature” all the time. You need to turn on “web & app activity” to use Google Assistant on an Android device for instance. It’s becoming quite clear that Google is monetizing its newest features with your data. In other news, Google also is adding music controls in Google Maps. You’ll be able to control Spotify, Apple Music and Google Play Music. It looks like the company is taking advantage of taller screens to add a banner near the bottom of the screen with the current song and the ability to skip a song or pause the music. There will be a new button on the right to open your music app, as well. Spotify users on Android also will be able to browse the Spotify library from Google Maps directly.